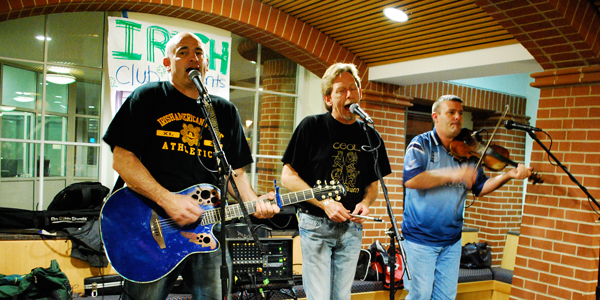 As Diversity Week ended, Quinnipiac’s Irish Club celebrated the traditional Irish way – with live music. Boston’s Irish rebel band, Boston’s Erin Og, came to QU solely for this event. The three members performed with only a guitar, whistle and fiddle, but drew a crowd of about 30 students in Mount Carmel Café. The band interacted with the audience and played a variety of modern and traditional Irish music. Sophomores Becca Humphrey, a journalism major, and Micaela Connor, a physical therapy major sat and listened to the band while enjoying the spread of free food. “Once we go some food and heard the music we decided to stay,” Humphrey said. “It makes you want to be in an Irish pub dancing,” Connor said. Patrick Noonan, a senior accounting and computer information systems double major is the event chair of the QU Irish Club. “We wanted to break the normal mold and just shoot for the stars,” Noonan said. Diversity Week is a special time for the cultural clubs within the university. Senior public relations major, Sonel Martinez was one of many to join in on Friday’s event. Martinez is an active member of QU’s Latino Cultural Society. “I like to embrace everyone else’s’ cultures, I would want them to do it for me, so I do it for them,” Martinez said. Along with this past Friday’s fall concert, the Irish Club will also host Potato Palooza and the annual St. Baldric’s fundraiser.